New Concrete Coating Converts a Dull Slab into a Colorful Canvas. The product we applied to the concrete was a composite polymer coating that revives and preserves existing concrete and asphalt structures. Generally speaking, maintenance for exterior concrete surfaces has been limited to two choices: regular re-sealing or demolition and replacement, both of which can be expensive and labor-intensive. However, ConcreteRevive fills cracks and covers stains, restoring old patios, pool decks, porches, walkways and asphalt blacktop. The coating will fill and conceal minor cracks in the concrete. 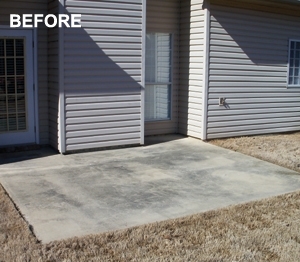 Using a new composite polymer coating, standard painting techniques are all that’s required to dramatically change the appearance of existing concrete. “Polymers and composites aren’t new,” says company president, Mitch Wood, “but what we are doing with them is.” Water-based and VOC-free, the new concrete coating is high-build and quick-setting. With little effort it achieves a textured, slip-, stain-, and scuff-resistant surface. And, here’s the kicker: The coating can be tinted by simply adding any color of paint you want. 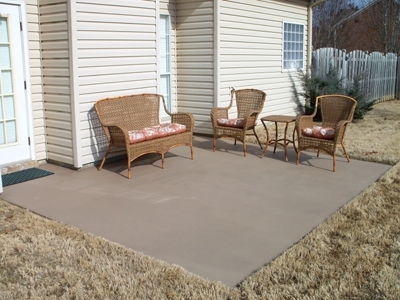 Acrylic latex paint is used as the pigment, so if you can find a paint swatch, then you can color your concrete to match. Basic paint tools are all that’s needed for the project, and the coating can be tinted any color you find at the paint store. The ConcreteRevive kits are packaged in a 5-gallon container for easy mixing. The kit contains two parts: liquid resin and a dry chemical. Two quarts of exterior acrylic latex paint are added for the color tone. With two coats applied to the concrete surface, each kit will cover about 200 square feet. 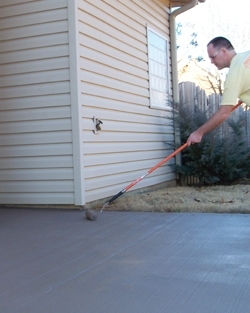 Before applying, make sure the existing concrete is clean, dry, dull and pH neutral. Remove any loose mortar or cement. 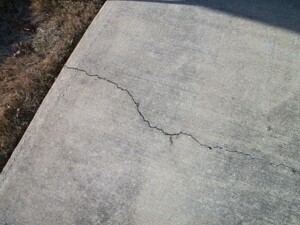 Use an acrylic concrete caulk to patch any large cracks (over 3/8 inch), and allow the surface to completely dry for 48 hours prior to application. Apply ConcreteRevive only in moderate temperatures. The ConcreteRevive product comes in a two-part kit. The color of the coating is achieved by adding acrylic paint to the mix. 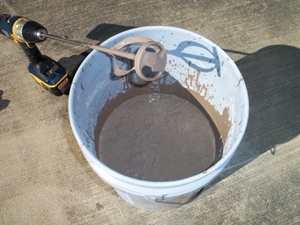 Begin mixing the product by emptying white liquid resin into the 5-gallon bucket. Add the latex paint to the resin and mix briskly for one minute. Slowly add the dry agent while stirring briskly with a drill mixer for five minutes. The powder should break down completely, and the mix will be smooth and viscous when ready to use. Mask off the area to be painted with painter’s tape. Use typical “cut-in” techniques to paint around edges, borders and adjacent objects. Cut-in with two coats, allowing them to dry between each. Remix the product every two hours during application. Allow the ConcreteRevive to dry to the touch (usually about 1 hour). Roll-on application makes the project easy for both DIY’ers and a professional painters. For the best coverage, paint the field of the concrete surface with a 3/8-inch nap roller, working in a north-south direction. Allow it to dry completely before applying the second coat. Apply second coat in an east-west direction. The second coat is critical to attaining the proper texture. Use a 3/4-inch nap (or larger) roller for the second coat. Nap size determines texture or “pile,” but also affects the square-foot coverage of product. The trick is to be consistent in your application technique. Allow the coating to completely dry before use. 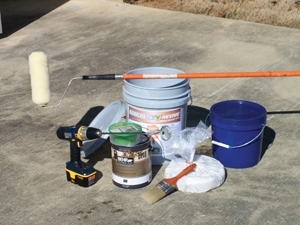 After the ConcreteRevive has thoroughly dried, Gulf Synthetics recommends applying two coats of a non-slip, non-yellowing acrylic topcoat made for decorative concrete. The topcoat adds an extra layer of protection and makes cleanup easier in areas where food, grease and dirty footprints collect easily. Follow the sealer manufacturer’s recommendations for best results. The entire process isn’t much more complicated than painting a floor, and the tools can be easily cleaned with water. In virtually no time, the slab had a completely renewed surface, at a fraction it would have cost for traditional concrete rehab. For more information, visit www.gulfsynthetics.com.